AlphaNinja - Below are some of the analyst community's most hated stocks. Some are gonners, such as GM. Others are possible gonners, and others have nowhere to go but up, as these are rated Sell or worse. Some have had extremely positive events, such as Sears' recent blowout quarter, bouncing the stock 100% before the sells could be turned into buys. Others such as K-Swiss are at risk of permanently losing their relevance (and shelf space). 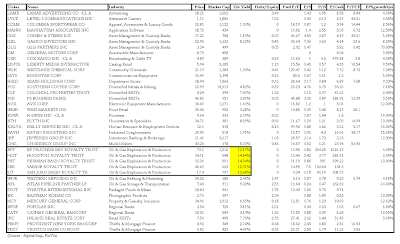 Of note, the oil&gas trusts have clean balance sheets, and yield north of 12% - worth a look.